The Applewood Sweet Shop is the new version of the Village Sweet Shop which has been refreshed in new colours to match the Applewood Department Store. 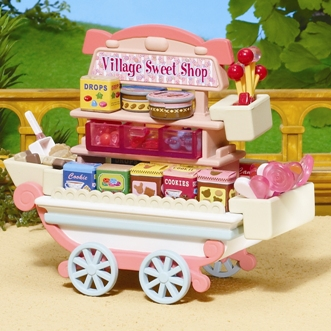 This product is still called Village Sweet Shop on the packaging, but we will refer to it in our dispatch notes and catalogues as Applewood Sweet Shop to avoid confusion between this and the original version. Set includes over 40 accessories including the stall itself along with lollipops, biscuits and sweets.